The brave photojournalists of the Associated Press' Saigon captured the harrowing face of the Vietnam war, sharing the bravery and drama of the conflict with those at home. As a result, the war left a deep and lasting impression not just on the soldiers at the frontline but the whole of America. 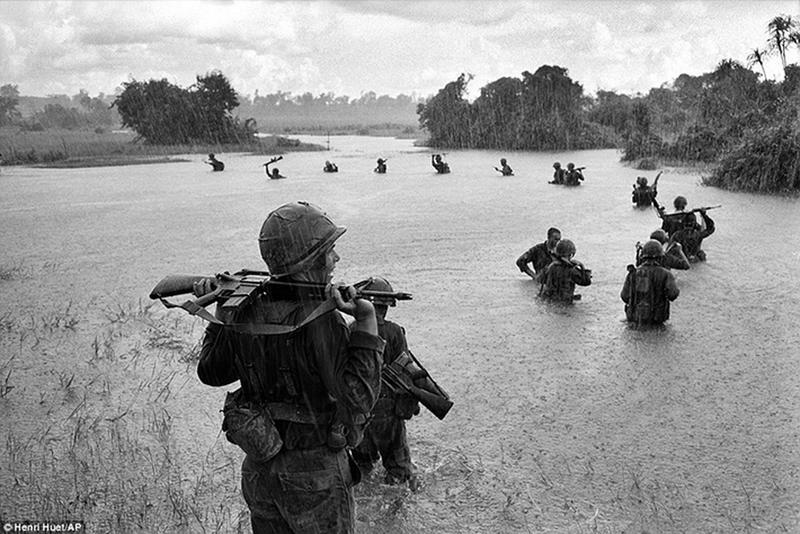 U.S. paratroopers of the 2nd Battalion, 173rd Airborne Brigade hold their automatic weapons above water as they cross a river during a search for Viet Cong positions in the Ben Cat jungle, September 25, 1965. 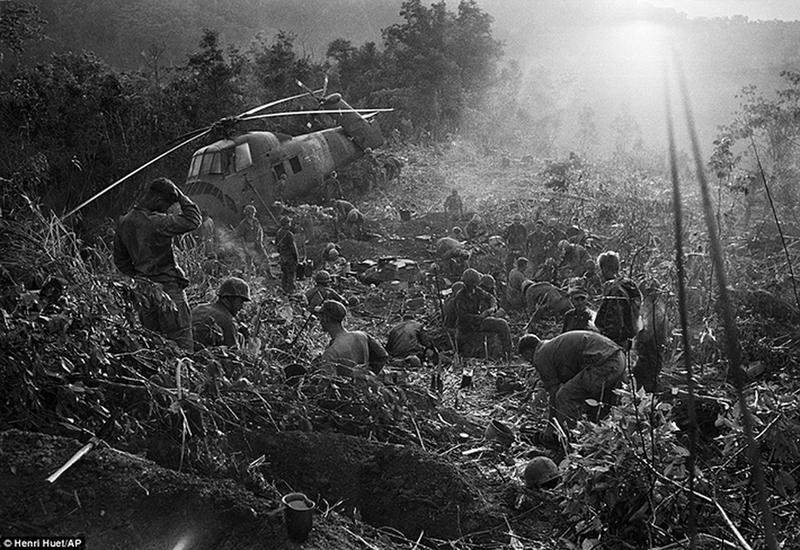 Henri Huet, the French war photographer who took this powerful image, died in 1971 when the helicopter he and three other photojournalists were in was shot down. 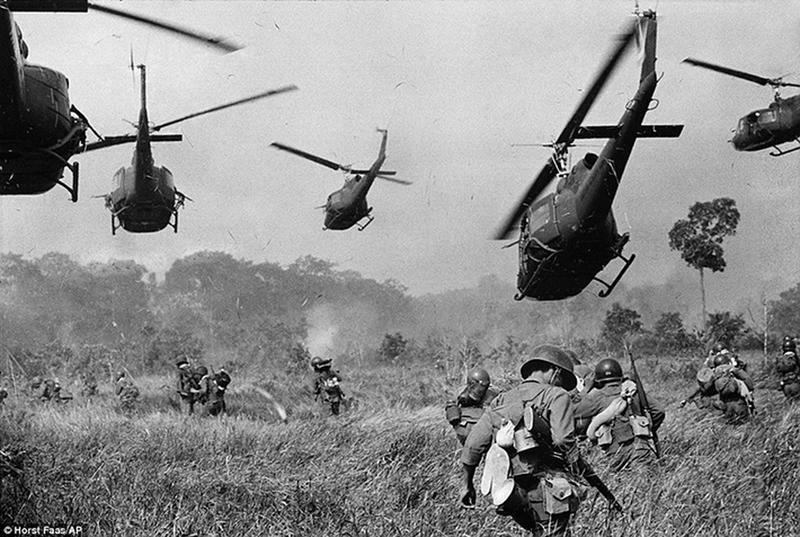 U.S. Army helicopters open machine-gun fire into the tree line to cover the advance of South Vietnamese ground troops as they attack a Viet Cong camp eighteen miles north of Tay Ninh, March 1965. This photograph was taken by German photojournalist and two-time Pulitzer Prize awardee Horst Faas. 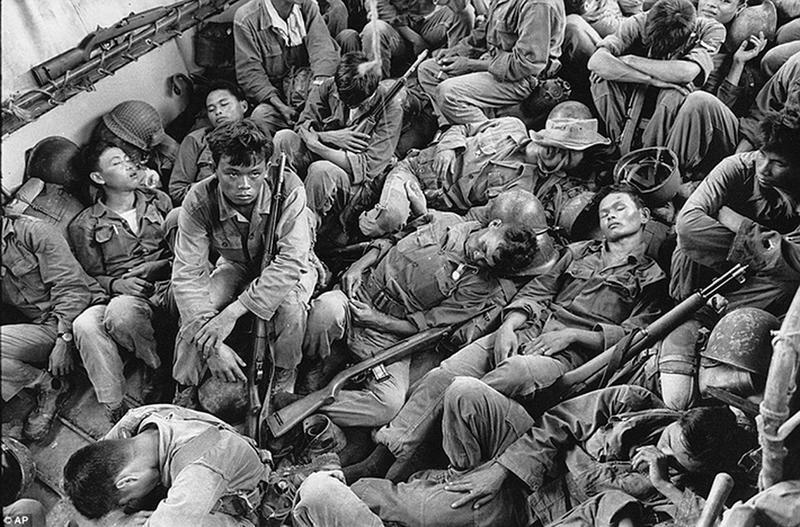 Soldiers from South Vietnam sleep on a U.S. Navy troop carrier after a four-day operation against the Viet Cong. 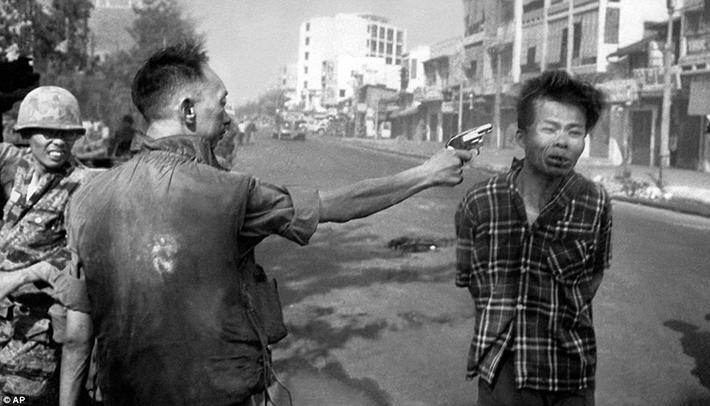 This iconic image shows police chief Nguyen Ngoc Loan about to execute Nguyen Van Lem, a Viet Cong officer, on the street in Saigon. 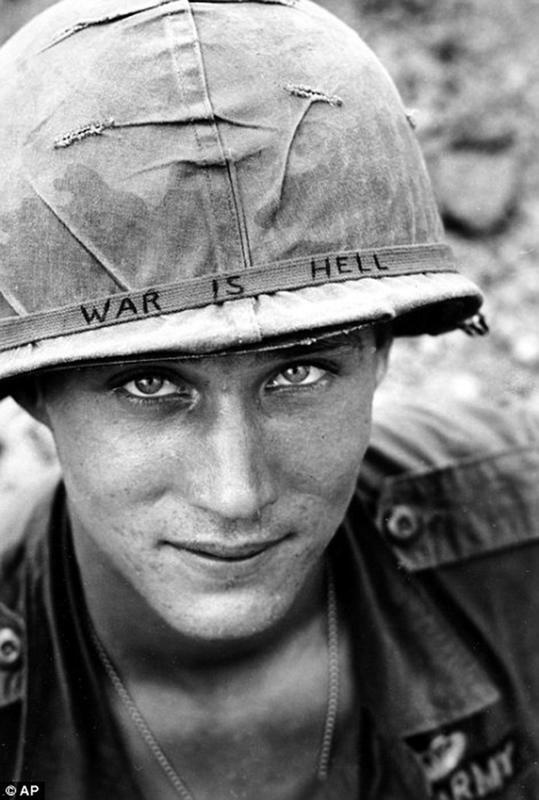 An unidentified American with an anti-war message on his helmet. Medic Thomas Cole tending the wounded Sgt. 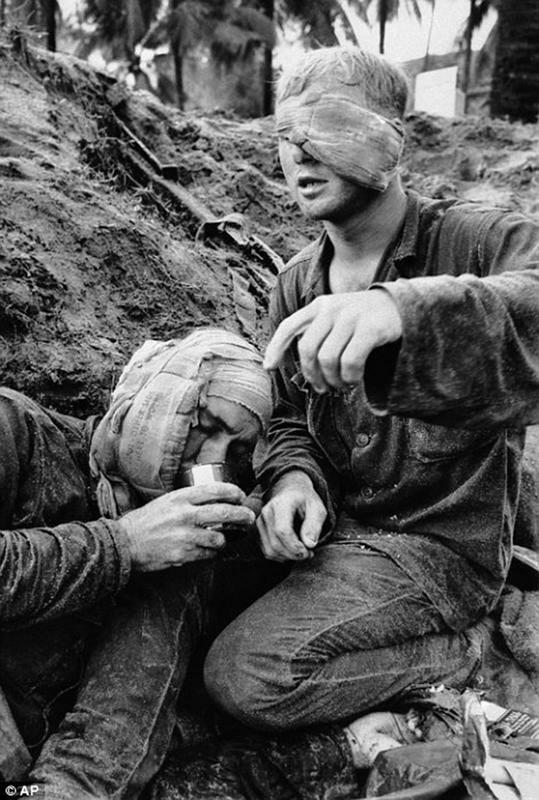 Harrison Pell during a firefight despite having a bandage around one of his own eyes. 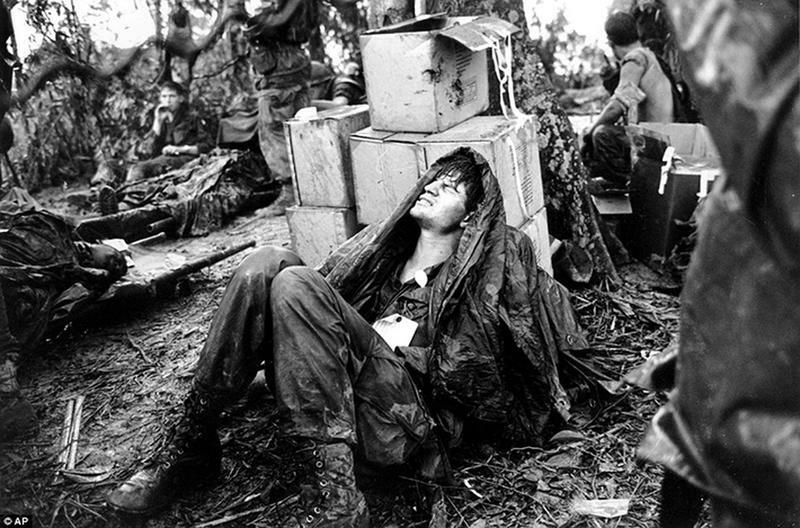 A wounded paratrooper grimaces in pain as he awaits medical evacuation from base camp in the A Shau Valley. 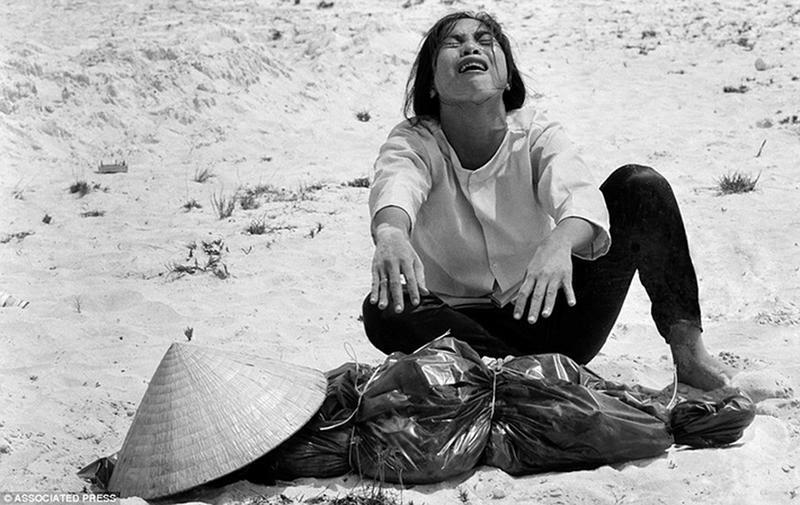 A South Vietnamese woman mourning over the body of her husband, found in a mass grave near Hue. Children running away in fear from the site of a napalm attack on a suspected Viet Cong base, 1972. 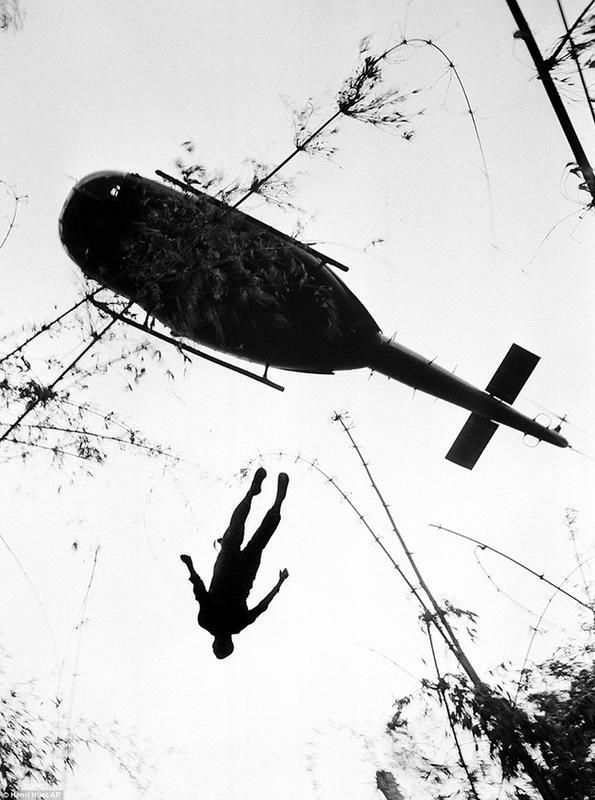 The body of a U.S. paratrooper killed in action in the jungle near the Cambodian border is lifted up to an evacuation helicopter in War Zone C, May 14, 1966. 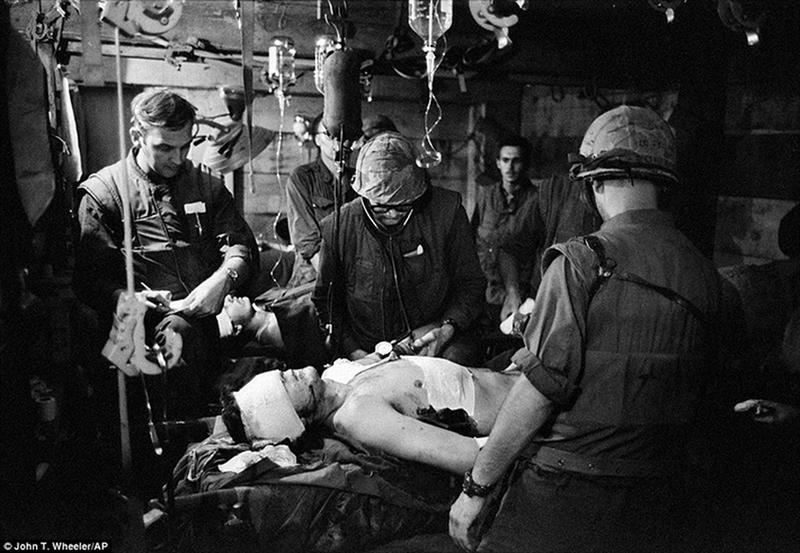 Dr. Joseph Wolfe, center, treating a wounded soldier while other physicians attend to patients in Charlie Med, a makeshift underground hospital at the Khe Sanh Marine base, March 1968. 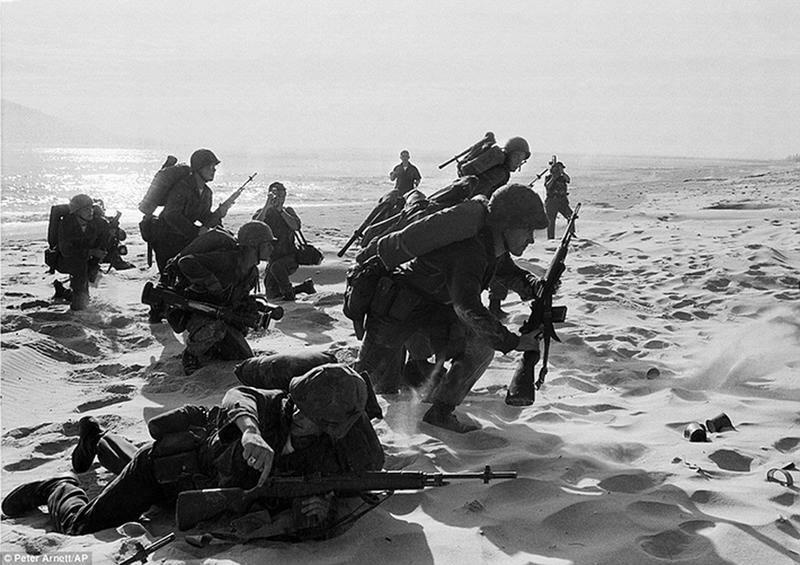 This photo is taken by New Zealand journalist Peter Gregg Arnett, it shows freshly landed U.S. Marines making their way through the sands of Red Beach at Da Nang, April 10, 1965. AVietnamese woman carries her baby and pulls her daughter toward safety near Tay Ninh. 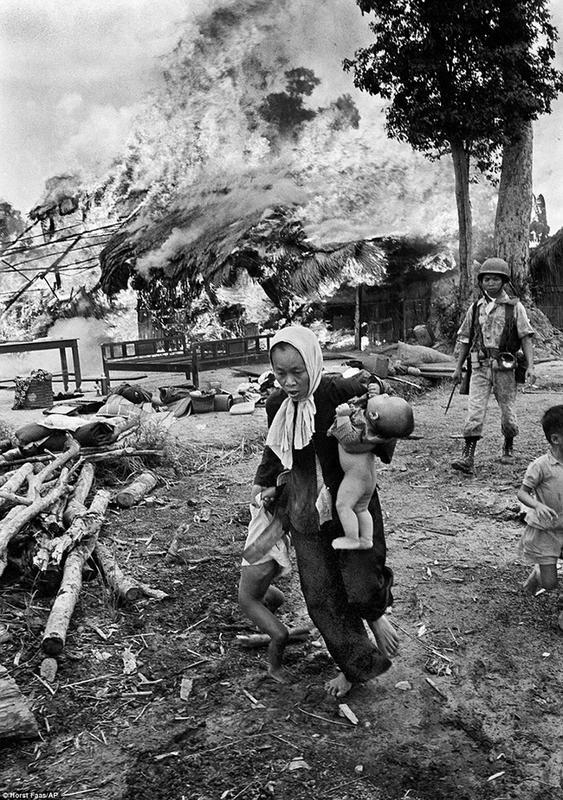 Their home is burning in a fire set by South Vietnamese troops, Saigon, July 1963. 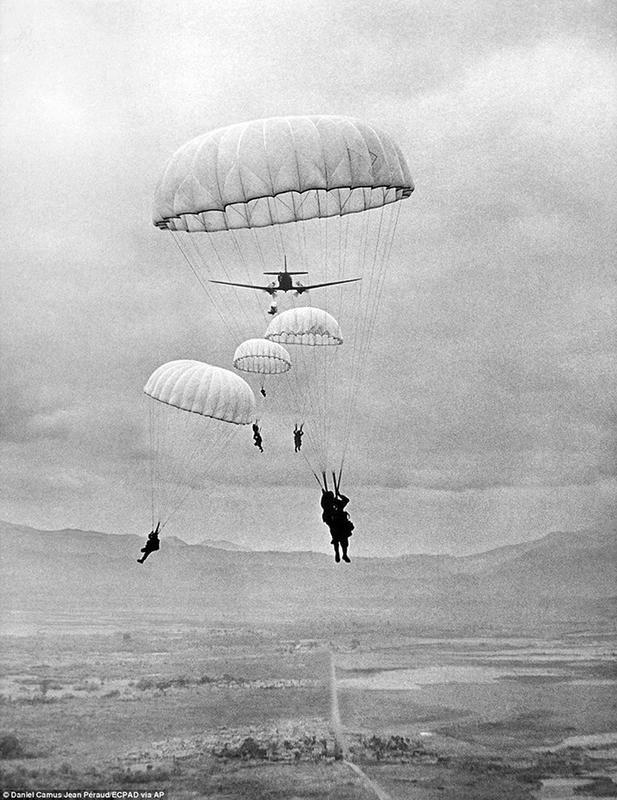 French paratroopers descending on the fortified outpost at Dien Bien Phu to provide reinforcements for soldiers fighting against a siege by the Viet Minh, March 16, 1954. 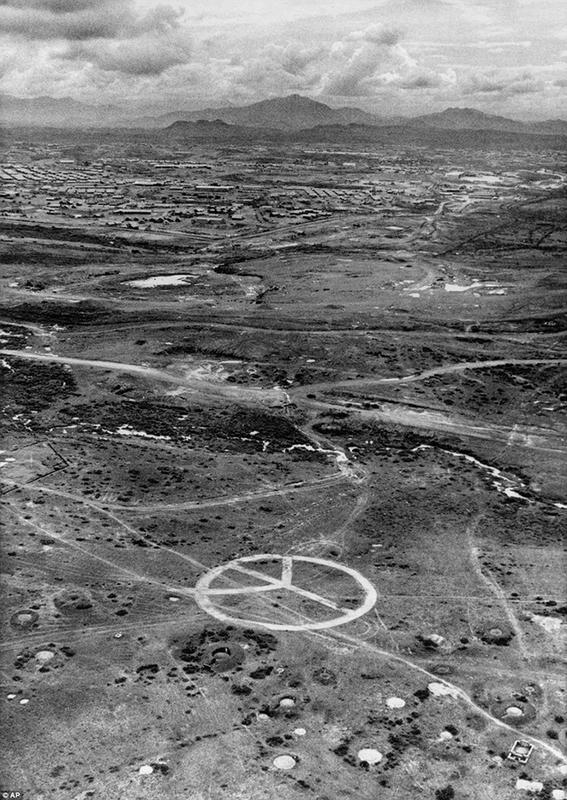 This aerial image shows a large peace sign, gouged out of the countryside with a bulldozer, near Camp Eagle, headquarters of the 101st Airborne Division, in the northern part of South Vietnam, May 8, 1971.